I used to love eating out. I would have counted it as a hobby, actually. A food lover and wine enthusiast, I relished the opportunity to try new foods, explore exotic cuisines, and sip interesting wine while enjoying great conversation and not having to worry about dishes. As I started cooking more though, I began to feel increasingly guilty about dropping five times what it would cost to make the same meal at home. And so I started to re-create some of my favorite dishes at home, googling recipes online and testing them in my own kitchen until they were just right. If you’re accustomed to eating out every meal and your fridge is full of Styrofoam containers and expired condiments, I recommend breaking the habit by starting with some quick and easy lunch recipes. Bringing your lunch to work saves a ton of time, money, and you can be assured what you’re eating is fresh and healthy. This recipe for tuna salad is not the soggy, smelly sandwich you dreaded finding in your lunchbox as a pre-pubescent middle-schooler. My version replaces the mayo with fresh, mashed avocado, incorporates celery and pickles for crunch, and pairs perfectly with some crispy romaine lettuce leaves, in case you’re off of bread this week. Healthy, fast, and delicious, this tuna salad is easily portable and perfect for a quick lunch on the go. I recommend doubling or tripling the recipe and knocking out your lunches for most of the week. I’m a big fan of prepping meals and cooking in bulk. If you’re going to be in the kitchen, pulling out all of your spices, chopping veggies, and dirtying your pans and counters, make enough food for leftovers. I swear by them. In fact, I usually make enough for 4-6 people, even when it’s just my boyfriend and I eating. I then package all of the leftovers in individual serving containers and use them for lunches throughout the week. It saves a ton of money ($10/day x 5 days a week x 52 weeks = $2,600!) and when you’re rushing out the door with mismatched socks and partially straightened hair, it’s nice to grab a pack out of the fridge and not have to worry about what’s for lunch. 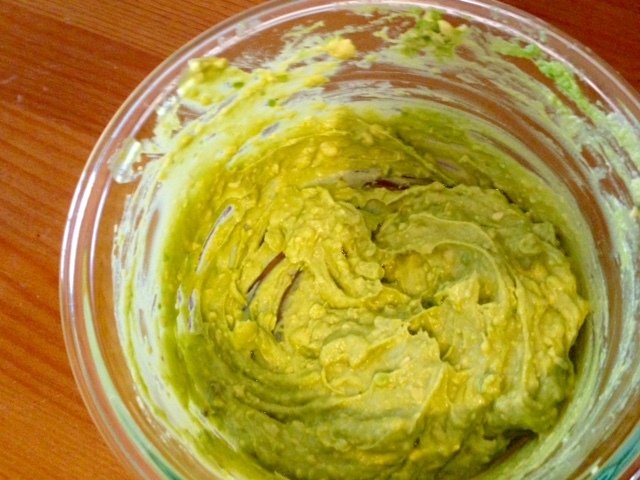 Mash the flesh of the avocado in a medium bowl until it’s reached a smooth consistency. 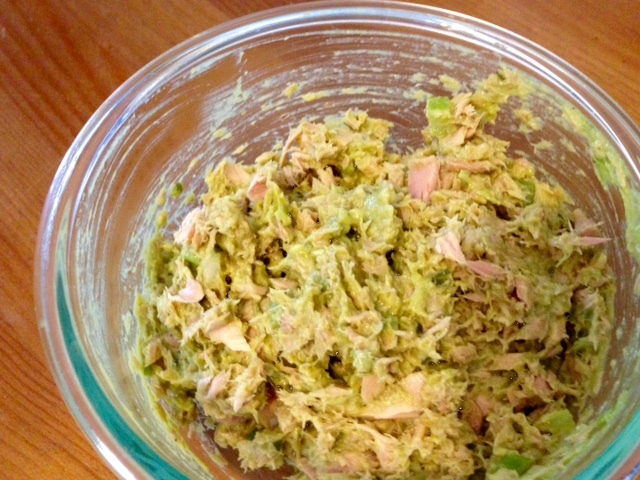 Mix in the rest of the ingredients except the tuna. Next add the tuna and stir until just incorporated. Stack two romaine lettuce leaves together so that they resemble a spoon or boat. 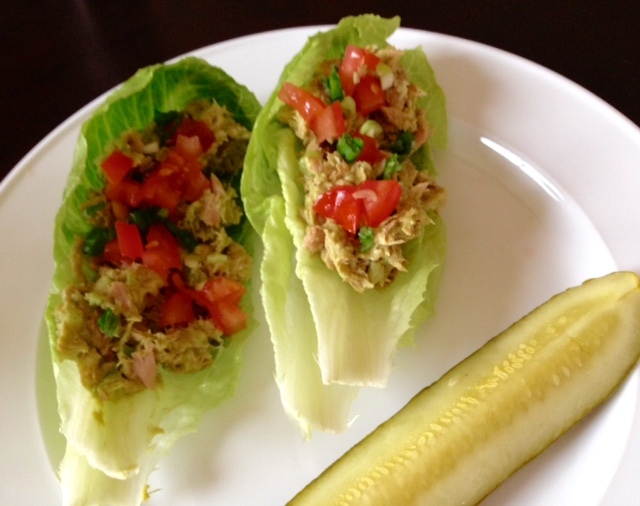 Fill the lettuce leaves with the tuna salad, spooning about a quarter of the mixture into each lettuce cup. Finally garnish with your favorite toppings. I added diced tomatoes and green onions.